Born and raised in Valla Beach, Heath Joske has made a name for himself amongst the greats in the surfing world. Over the years, Heath has reigned victorious in a number of events and is slowly climbing his way up the ranks. 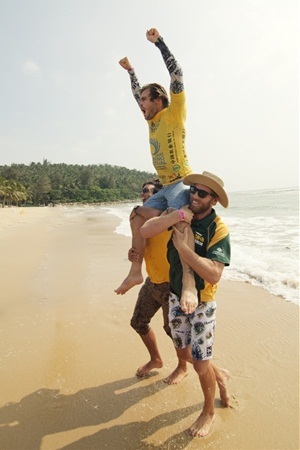 His most recent achievement was his gold medal win in the inaugural ISA China Cup on Hainan Island just two weeks ago. With time ticking away in the final of the open mens division, Heath was sitting in fourth. In a matter of minutes, he had the rest of the field needing a combination of scores to catch him. Back on home soil, Heath took time to chat to Guardian News journalist BRITT RAMSEY about his gold medal performance and future goals. Britt (BR): Firstly, what is the China Cup? Joske (HJ): This was the first year the China Cup was held. It’s a team’s event, where the top eight surfing nations send a team of four guys and two girls to compete individually, but earning points for their country’s total. USA, France and Brazil had the best teams (other than us/Australia) and they included guys such as Cory Lopez, Chris Ward, Marc Lacomare and Wiggolly Dantas. BR: How do you feel having won the ISA China Cup for Australia? HJ: To get a win in the inaugural event, an historical event – I’m stoked It feels amazing to win the China Cup for Oz, having a team behind you, supporting and barracking for you on every wave is epic. It’s a really nice change from normal competition, where you can sometimes feel like you’re doing it for yourself, and no one wants to see you actually do well. Being chaired up the beach and hearing the Ozzie chant we do when a team member wins a heat feels epic and gets you super pumped up. BR: How did you feel in the last few minutes of your heat? Did you have a strategy? HJ: It was a 35-minute final and I had a total of only two points with 12 minutes to go. I had been taking off too deep, and getting too caught up with hassling and jostling for position. I decided to move away from the three other competitors and sit a bit wider. Luckily I caught a wider set and scored an eight, then backed it up straight away with a nine. The other guys were needing two scores and I was pretty safe for the win then. It felt amazing to come from behind and go to a commanding position within a few minutes. BR: Did you feel as though all your practice and hard work paid off? HJ: It’s always nice to win and feel as though my surfing and training has paid off, though I’d surf everyday and live the same way I do now, even if I were never to compete again. HJ: The surf was pumping for us in China. It was a left point, similar to Crescent Head but in reverse. It was super rippable, and we were lucky to get a good swell that lasted the competition period. We had waves that are better than 80 per cent of the World Qualifying Series (WQS) events that we normally compete in. Apart from the contest wave, there are waves everywhere and I was lucky to score a few other super fun surfs with no one out. Surfing is still very unheard of in China. BR: What’s the next major event you’re set to compete in? HJ: The next events I will be surfing in are the Australian WQS events, firstly Burleigh and Manly in February, then Newcastle and Margaret River in April. BR: Who do you look up to in the surfing world? HJ: I look up to a lot of different people in the surfing world, but the people that inspire me most would be Dave Rastovich, Dave Reynolds and the late Andy Irons for the different lines they draw on a wave. They are who they are, and don’t try to be anyone else. My brother Sage is in the same boat, he rips and he is who he is and no one is going to change that. I respect that in people. BR: Where are the best places you’ve surfed? HJ: I’ve had amazing waves in a lot of different places, South Africa last year was incredible and the Caroline Islands were also some of the biggest barrels of my life – but I still prefer surfing my home breaks, by myself or with a few friends, we get some pretty amazing waves here sometimes. BR: Is it always good to come back home after a tournament? HJ: It’s always good to be home, and the more I travel the more I cherish my short stints back here. Although, after a few weeks I get the sting to travel again. BR: I understand both your dad Paul and brother Sage are surfers, did they inspire you to take up surfing? HJ: Yes, they definitely inspired me to begin surfing and have mentored and supported me throughout my whole career. My dad shaped boards for me until I was 21, and now my brother has taken over Valla Surfboards he shapes me a lot of boards. It’s great to have a good connection with a shaper and be able to work closely on refining my boards. BR: And lastly, what’s next for Heath Joske in 2012? HJ: 2012 I will be competing on the WQS again and trying to earn some valuable points and money. I also want to spend a lot more time in South America exploring the continent for un-crowded, pumping waves because there is a lot there and I need to be on them.